“No standing at any time” – even to consume food and drink, with the exclusion of restaurants, cafés, and refreshment areas. Is this really the case? No standing still at all? It seems bizarre, surely it's much worse to be checking a map, your phone, or using a camera while remaining in motion at all times? È proibito comunque sostare per consumare cibi o bevande ad esclusione delle aree in concessione ai Pubblici Esercizi. It is forbidden to stop to eat or drink except in areas designated to Public Spaces Used Commercially (i.e. bars, restaurants, fast-foods, ice-cream vendors, etc.). Which basically means "no picnics". ... not from the "upright on two feet" sense of the word. Clearly from context, they don't want you sitting in these places either. Except in specifically designated areas, it's forbidden to sit in St. Mark's Square and in Piazzetta dei Leoncini, beneath the arcades and on the steps of the Procuratie Nuove, the Napoleonic Wing, the Sansovino Library, beneath the arcades of the Ducal Palace, in the impressive entranceway to St. Mark's Square otherwise known as Piazzetta San Marco and its jetty. and its [St. Mark's Square's] jetty. This basically seems to be a list of pretty much all the stuff in St. Mark's Square. ... and those guys in uniform don't look too concerned. The regulations are obviously in Italian, so I will translate them for you. spogliarsi e vestirsi sulla pubblica via e in luoghi esposti alla pubblica vista. 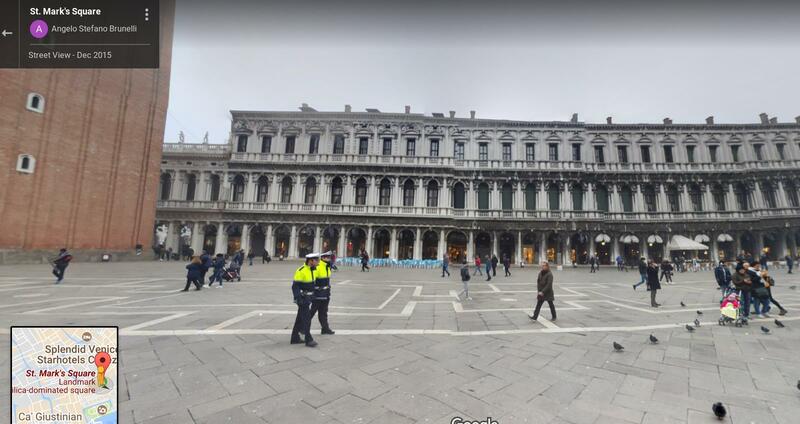 Nella Piazza San Marco, lungo i portici e le gradinate delle Procuratie Nuove e nella loro prosecuzione per l'Ala Napoleonica e la Libreria Sansoviniana, nella Piazzetta dei Leoncini, lungo il Porticato di Palazzo Ducale, nella Piazzetta San Marco e sul molo, è proibito sedersi al di fuori degli spazi specificatamente a tale scopo adibiti. E’ proibito comunque sostare per consumare cibi o bevande ad esclusione delle aree in concessione ai Pubblici Esercizi, ovvero gettare o abbandonare sul suolo pubblico carte, barattoli, bottiglie e qualsiasi tipo di rifiuto solido o liquido. In San Marco Square, along the arcades and the stairs of Procuratie Nuove and on their extension towards Ala Napoleonica and Libreria Sansoviana, in Piazzetta dei Leoncini, along the arcades of Palazzo Ducale, in Piazzetta San Marco and on the wharf, it is forbidden to sit outside the spaces specifically meant for that. It is in any case forbidden to stop/stay for eating or drinking, excluding in areas that have been rented to businesses [translator's note: this basically means bar, pubs and restaurants, their premises and their tables even if located on public soil], or otherwise to throw or to abandon paper, cans, bottles or any kind of solid or liquid trash on the public soil. Fatte salve le norme in materia di circolazione stradale, sui percorsi pedonali di maggior flusso turistico del territorio del Comune di Venezia, così come identificati da apposita ordinanza sindacale, è vietato sostare senza motivazione, provocando intralcio alla circolazione, con comportamenti quali la mendicità su suolo pubblico o accessibile al pubblico. Salva l’applicazione delle norme penali, ai contravventori al presente divieto, qualora l’intralcio sia finalizzato alla raccolta non autorizzata di danaro o altre utilità, si applica la sanzione amministrativa accessoria della confisca del danaro che costituisce prodotto della violazione, come disposto dall’art.20 della legge 24 novembre 1981, n.689, previo sequestro cautelare ai sensi dell’art.13 della citata legge n. 689/81. Without prejudice to the rules on road traffic, it is forbidden to stop without motive on the pedestrian routes of high tourist flow in the territory of the Municipality of Venice (as identified by a specific order of the Mayor), causing obstruction to circulation, with behaviors such as begging on public or publicly accessible soil. Without prejudice to the application of the criminal law, if the obstruction is aimed at the unauthorized collection of money or other benefits, the violators of this prohibition will receive the administrative sanction consisting in the confiscation of the money obtained through the violation, as provided by art. 20 of law n. 689 (November 24, 1981), in the form of precautionary seizure pursuant to art. 13 of the aforementioned law n. 689/81. The English version of the website is poorly translated due to the fact that the Italian verb sostare is a combination of "to stand" and "to stay" with the connotation of occupying a space (it also means "to leave your car parked"). It does not mean that you cannot stand still and look at the buildings, or check your phone. It means you cannot occupy a space for eating (like a picnic) or by obstructing the pedestrian traffic. I don't speak Italian, but we have a similar rule here in a very popular mall that people cannot stand around talking / eating if that area is not part of a restaurant. This rule is to prevent a concentration of people impeding traffic or other movement by simply standing around; especially in busy areas. Strictly to prevent traffic jams as the place is very crowded with foot traffic - especially on the weekends; and tourists (this is very popular, very large mall) tend to somehow stop in the middle and take pictures, chat, and sometimes even picnic(!) on the sidewalk. I even once saw a bunch of people lay out a rug and picnic basket in the escalators by the parking lot on a grassy knoll. Not the answer you're looking for? Browse other questions tagged legal food-and-drink italy venice translations or ask your own question. Is it illegal to serve baby seafood in Italy?